BTW, in case anyone stumbles on one of these pages out of order, and wonders how to get the hell away find the rest, I’m trying to gather them all here. Enjoy. Or not. It’s up to you, really. Who am I to tell you what to do? So, in this post, we look at “Notes on Fantastic Beings”, and alignment. Sorry, allignment. For charcters. Sorry, characters. Or, more accurately, “Notes On Fantastic Beings”. Those of you more used to modern games, with their 256 page hardbound books detailing every aspect of a race’s culture, heritage, history, and preferred sexual positions might be a little aghast, possibly even awight or aspectre, at how little information was generally provided back in Ye Olden Dayse, and Dave Hargrave’s writing style was nothing if not terse. He had, after all, an imagination that spanned multiple infinities, and a hundred half-size pages to try to cram it into. So, we get to these two pages of “Notes”, where all the infinite complexity and depth of distinct and unique species were reduced to a line of text. So, from this we learn orcs are immortal, elves are in self-denial, amazons are pushy lesbians, and (on a page I didn’t scan) that harpies, furies, and gargoyles are “erratic, fanatical, and sadistic”. We also learn that genetics in Arduin were pretty darn fluid, and that human-giant matings were possible, though, thankfully, the exact details of the process were left out. I seem to recall a “kobbit” is a kobold/hobbitt(sic…k of typing ‘sic’, just deal with Mr. Hargrave’s “Please Don’t Sue Me” spelling) crossbreed, which is kind of gross, but “kobolds” back then were generally closer to their mythic origin as fey “little people” and less “tiny little dragon folk with serious delusions of grandeur”. It is interesting how most of the non-human races had long, even unending, lifespans — a definite flip on the D&Dism that all the ‘evil’ races died young (to explain their ability to breed in massive numbers so that dungeons were perennially replenished with mooks). Such debates have run to terabytes of terrifying text (I do get paid by the Alliteration Alliance Of America, why do you ask? ), and I, in the words of Whitman, “have contributed a verse”, if “Look, lint-for-brains, even given your established stupidity and bull-headedness, your latest piece of word-salad drivel reaches new heights of incredibly inchoate incomprehensibility” is “a verse”. Mr. Hargrave, however, strips all of that down to a simple, single, page that clearly answers all possible questions. Or, perhaps, not. But as with most of his work, it aims to inspire more than to inform, and that’s not wrong. 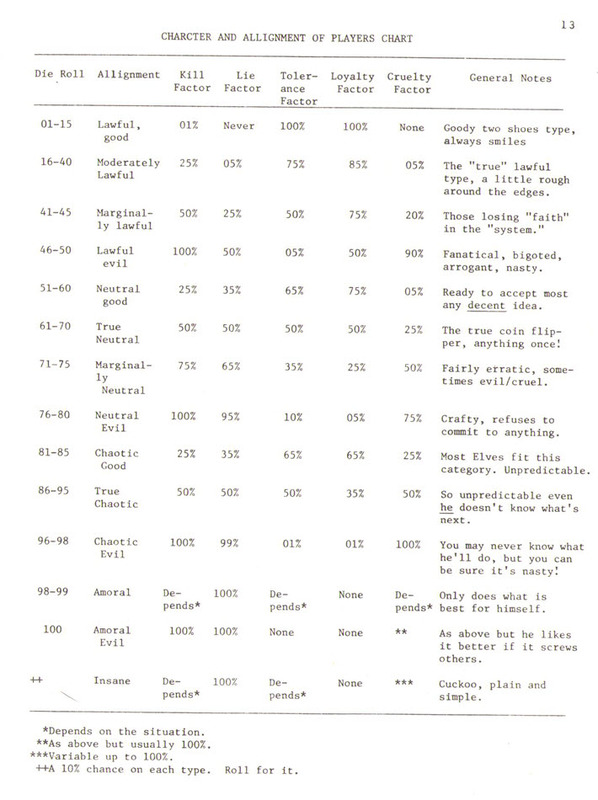 It is perhaps worth noting the chart discusses the “Charcter” and “Allignment” of players, and if one interprets “Character” to mean “Morality and Ethics”, then, the chart is actually for the people sitting around the table, which might say a lot about who Dave gamed with. And I think I’ll declare that any similar errors found in these pages is my attempt to capture the true spirit of the age, and not merely laziness or incompetence on my part. Yeah. That’s the ticket. But enough about me. (Ow… even typing those words hurt my soul.) Let’s look at the chart. First, you’ll notice a lot more alignments. (No, I’m not going to keep typing ‘allignment(sic)’. Even I know when to stop running a joke into the ground. I usually don’t stop, but I know when to. And knowing is half the battle.) The Arduin Grimoire was published in 1977, before most of AD&D came out, and the D&D world was still transitioning. Alignments had gone from three, to five, to nine, in just few years… and many early players, seeing the flaws of the original L,C,N system, were creating their own before Gygax could jump in. We see, thus, shadows of homebrew rules mixed in with the changes to the “core” rules. Give Me A Break, I Have A Fifty Hour Work Week+2 Hour Commute And I Don’t Get Paid To Write This, You Know. My Paypal Is lizard@mrlizard.com. Just Sayin’. So, we have Kill Factor, Lie Factor, Tolerance Factor, etc. These are used to… erm… uhm… well, basically, there’s no real rules for them. Everyone buying the Arduin Grimoire, unless they happened to know Dave personally, could interpret these numbers however they chose. 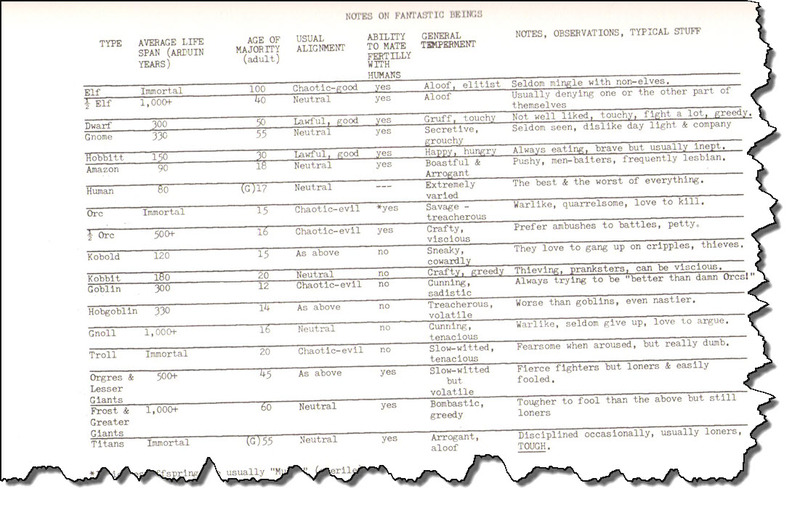 It’s interesting that even in those earliest days of gaming, there was a nascent push towards personality mechanics, something to reinforce, with dice, what it said on the tin, if your character sheet was printed on tin. “Lie Factor” is kind of interesting. I mentioned typos earlier. Well, one such typo in original D&D was an entry for “%Liar” on every monster. It was supposed to be “%Lair” — the odds that a monster, when randomly encountered, would be in its lair, where it had a lot more treasure. However, early players, taking the rules as written, often interpreted it literally. 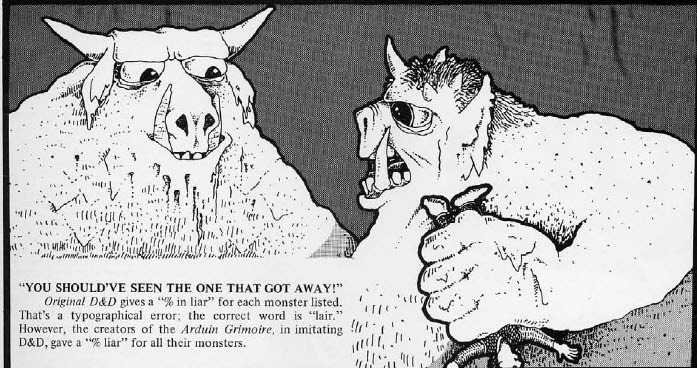 Dave Hargrave included “%Liar” in the monster section of the Grimoire, which we’ll get too eventually. The context around these entries made it very clear he did, indeed, mean “Liar” and not “Lair”. Murphy’s Rules later dinged him on this, noting he had simply imitated D&D, and he responded with, sadly, an all too typical reaction, insisting he’d always meant for Greedo to shoot first…. erm, that Arduin was a free-standing game and not an ‘imitation of D&D’. Yeah, right. It is, in fact, possible for me to consider Mr. Hargrave a Greater God (400 HP and all!) in my personal pantheon of creative influences, and still roll my eyes and sigh at the kind of self-delusion that would cause him to make such a claim. Everything about the original Arduin Trilogy speaks to its role as a supplement to D&D.